As we pray for our parishes, we contemplate on Christ’s passion as He carried the cross and walked to His crucifixion. As Filipino Catholics, we are called to bring the Gospel to society, and society to God. In the midst of the challenges in our country today, let us join the Via Crucis fervent in prayer, fueled by our love for our country, firm in our desire for justice and fully aware that peace cannot coexist with terror and tyranny. In an effort to make our voices be heard, statement shirts that proclaim the value of life are available at St. Paul Media Center, St Jude Parish - Naga City, and Ateneo de Naga University Press. 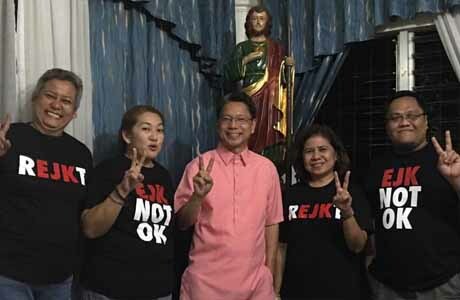 We encourage everyone who will make the Way of the Cross on March 1 to wear the shirt as a vote for life and against killings and death penalty. Those who cannot wear the statement shirt, please wear any white or black shirt. Let us pray for our parishes so they may be instruments of conversion. Let us also pray for our own conversion so we may be worthy disciples of Christ. Let our voices be heard.